Oh yeah, I forgot to mention that on Saturday - before the deluge as I was walking towards my seat down at the Festival Curve, four “Tough talkin’ Hood Boyz in Pro Team logo knock-offs;” Err, four young lads in black t-shirts passing me by said: “Hey-hey-hey; LOOK! Check it out; 3-3-3!” As apparently the ‘Fly yellow Scandia 333 jacket is definitely the coat to have, eh? As I’ve been sporting IT everywhere... To the track, the restaurante, hotel, etc. So far, so good - as I know I shouldn’t be talking ‘bout I-T but the weather’s looking mucho better so far... Having had an early breakfast I decided to stroll thru my hotel’s lobby in my ex-Scandia team gear! 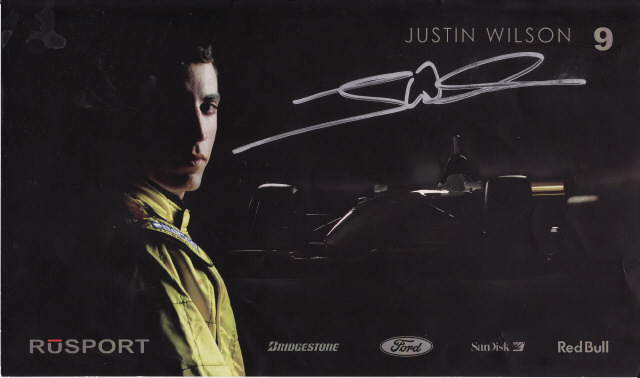 As I heard a group of men at the front counter talking about various racing drivers to which I couldn’t help myself and interjected Justin Wilson’s name twice, as ‘Juan replied; there you go, while the other gentleman said COOL! In regards to my jacket as I made my way back upstairs to my room; as the weather was indeed much more cooperative, as it was dry all the way over to the track; as I’d originally intended to arrive at my seat for the second Atlantics race. Yet I ended up arriving so early that I caught the entire Champ Car warm-up session proceeding the Atlantic’s. And they put on an excellent second race, which was followed by the Champ Car driver introductions. After putting the rain gear back on once again for a passing shower during the Atlantics race, the rain basically stayed away for the remainder of the day, although a fellow fan above us told the couple sitting in front of me. DON’T take that off until about 5:30PM! As I did finally take off my raincoat prior to the green flag being dropped; which was preceded by an overly annoying fireworks blast. This was followed by a wonderful fly over by a lone vintage P-51 Mustang! And I find that the sound of a Rolls Royce Merlin piston engine has to be one of the sweetest sounds of Aviation! And I was rootin’ for “Jimmy Heath cliff” (James Hinchcliffe) to win today - as I believe these were the days prior to him winning his Mayorship, eh? As ‘Hinch started once again from Pole, securing P1 both days - and began both races by leading; yet once again Hinchcliffe got snookered on a restart and Kevin “Somebody?” starting only his second ever Atlantics race took the win instead. 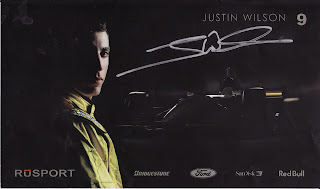 As it was quite hilarious to Mwah that the weekend’s Atlantics races were swept by a pair of 18-year old ‘KuhNucks scoring their debutant Atlantics victories with thy ‘Young Wicky (Robert Wickens) taking Race-1 and Kevin Lacroix winning Race-2. As apparently this was to be the zenith of Lacroix’s climb up the ladder system - as after finishing ninth overall in a full Atlantics season for Derrick Walker for ‘08 he mysteriously disappeared from the racing scene after that. And as I noted previously - they did ‘Somme-then absolutely STUPID in my mind - lighting off some exceedingly LOUD Boom Boom fireworks prior to the starting of the Champ Car race I believe? As SHEISA! I actually witnessed le ‘Hamburgular making the winning pass when he out braked Wilson into the Festival Curve before pulling away from the somewhat shocked Englishman, right? As I can only surmise that Wilson’s healthy lead wasn’t big enough to negate his time lost entering and exiting Pitlane. While Doornbos finished on the podium’s final step - saying he’d had trouble on his “Reds” (alternate rubber) today, but is third in the point’s standings and definitely wants to win some races this year. And I mused to myself if this would be a Young Guns Trifecta today - after the two 18yr old ‘KuhNucks had won in Atlantics would it be the 18-year old Graham Rahal’s turn today? NOPE! As I noted that Rahal Jr. had a pretty rough day - going off track several times I believe and finishing somewhere at the tail end of the grid. Also laughed over listening to the Atlantics - as one driver totally peeled-out trying to heat-up his tyres during a restart, while I could hear another competitor’s brakes squealing in protest before engaging in his burnout... Obviously you need to be stomping the brake pedal pretty hard to do that, eh? As the tape suddenly came to the end of its loop; and now five-years later, I have NO clue if I recorded any more of this riveting story on another missing cassette tape? So all I kinda remember now - some five-years later is the surprise I played upon myself when arriving at the train station to return home after a leisurely last breakfast at Elmer’s and another enjoyable shuttle van ride with my Numero Uno shuttle driver Donnyell. And I really don’t know if I should admit this - but imagine my shock when the Amtrak attendant at Portland told me that my ticket was for Vancouver, Washington to Seattle; Huh? WTF? As that’ll be another $14.00 sir if you wish to take the train from Portland? As apparently I’d had Vancouver, British Columbia on my mind when I’d made my reservations with “Julie” the female talking robot; CRIKEYS! SHAME ON YOU INDY CARS! So what really did Allmendinger take?